Stopping the D400 The D400 is a robust machine and can safely be left operating in most wind speeds. However, where extreme storm force winds are forecast, it is prudent to stop the machine and secure the rotor blades with a rope lashing. The D400 can be stopped by gripping the tail and turning the machine out of the wind, securing the blades once they have stopped rotating. Braking Switch: A braking switch can be fitted which provides a convenient aid to stopping the D400. The switch should be a double throw ‘break-before-make’ type, rated at least at 40 amps. When operated, the switch disconnects the batteries from the D400 before short-circuiting the turbine. The short circuit slows the rotor blades making it easier to turn the machine out of the wind and to secure the blades. Please note: the D400 utilises a purpose-designed, highly efficient, axial field ironless alternator. This configuration delivers exceptional power outputs coupled with smooth, low friction running. These attributes are retained to some extent when the braking switch is applied, and in consequence the electro-magnetic braking effect is not as marked as with other machines of more conventional alternator design. In certain conditions, the rotor can overcome the braking effect altogether, which results in damagingly high currents being produced in the stator windings. 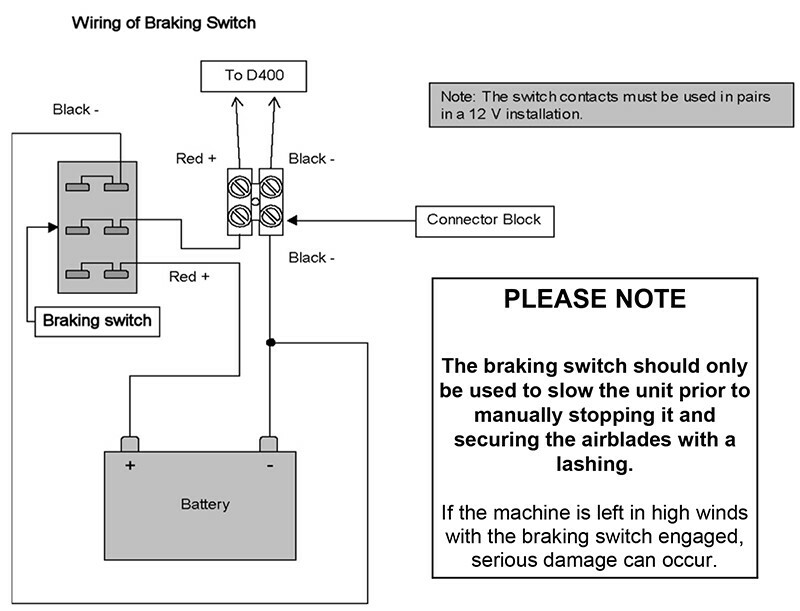 For this reason the braking switch should only be used to slow the unit prior to manually stopping it. It is not a parking switch. If the machine is left to run with the braking switch engaged, serious damage can occur to the generator.